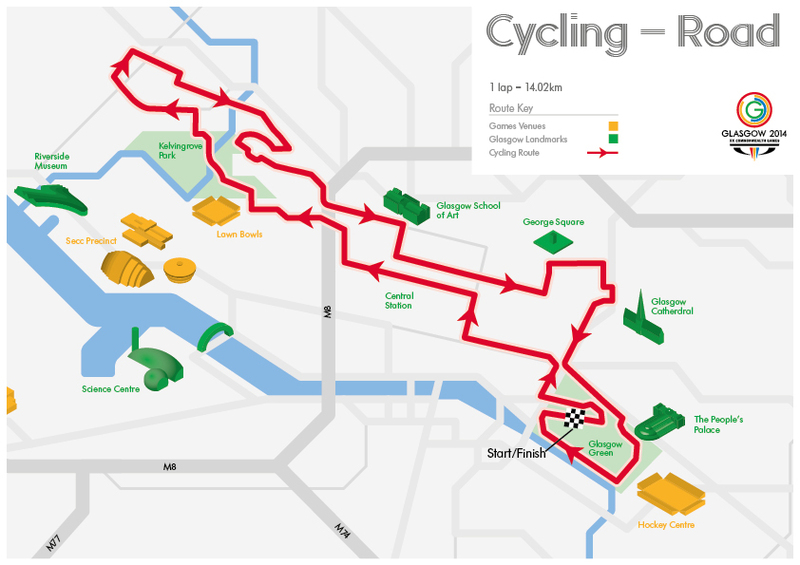 Revealed today are the routes for the Glasgow Commonwealth Games 2014 cycling road events that will see elite athletes from across the globe race through the heart of Glasgow and beyond. The excitement of the Games will reach audiences in towns and villages around the city as riders battle against the clock during the Time Trial event on Thursday 31 July, while Glasgow itself becomes the race track on Sunday 3 August with the fastest riders chasing each other through the city’s streets for the action packed Road Race. The announcement follows the reveal of the Glasgow 2014 Marathon route, which also takes in a number of Glasgow’s key city centre landmarks. Spectators won’t require a ticket to be a part of the Games along both the Cycling or the Marathon routes as all three events are free to view, giving everyone a chance to experience the thrill of live sport first hand. The courses have been developed in collaboration with a range of sport, city and tourism stakeholders to ensure that the sport technical requirements are achieved while balancing this unique opportunity to showcase the city and its surroundings to the world. It has also received endorsement from the UCI and will receive final certification closer to Games time. Glasgow 2014 is working with partners including Glasgow City Council and Transport Scotland to minimise any disruption on the day of the event, which will see temporary changes put in place for traffic. Travel conditions are expected to be different to normal across the city and spectators are advised to plan their travel in advance. Further information will be made available via GetReadyGlasgow. 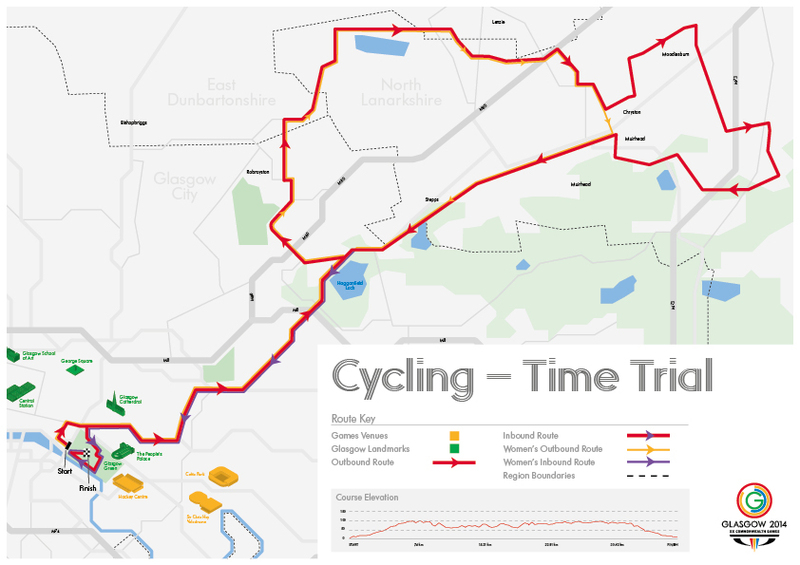 The Time Trial will see top Commonwealth cyclists take on a challenging route (40km for men, 30km for women) that will start and finish at Glasgow Green with a single loop course taking in the great countryside of East Dunbartonshire and North Lanarkshire as well as the city’s East End. The Road Race course, also starting in Glasgow Green, features a 14km circuit taking riders along Argyle Street, Buchanan Street and St Vincent Street before carrying on to the west end of the city where they will pass through Kelvingrove Park and circuit the west end before heading back towards the city centre and the finish. For the men’s race, competitors will complete 168km and lap the course 12 times. Female riders will complete 7 laps and 98km. “Cycling is among the fastest and most thrilling events at Glasgow 2014 with the Road Race and Time Trial offering fans the chance to experience the excitement of the sport up close. “Road Race riders will take in some of the best sites in Glasgow, as well as some challenging climbs, while those undertaking the Time Trial will hit the open roads and head out of the city in a challenging race to the finish. “Following on from the record breaking success of the 2013 British Cycling National Championships, which were held on the same course, I am sure the Road Race will be a fantastic spectacle showcasing the best of Glasgow to the world whilst offering a true test to the riders, many of whom will be travelling directly from the Tour de France to compete. “The Time Trial route has been designed to present the athletes with a truly sporting and testing course. This course will offer riders and spectators a variety of road types, surfaces and landscapes whilst also bringing a free Glasgow 2014 experience to the public in the neighbouring local authorities.